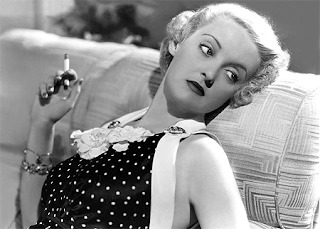 If Bette Davis were alive, today she'd turn 100. Some interesting articles about her career and her successes can be read here and here. A two time Oscar winner, the indefatiguable Davis hailed from the Bay State (one source says Lowell, another Newton -- I'll have to do some more research to be sure.) I can't think of a single actress working in Hollywood now whom I'd compare to her -- they just don't make 'em like they used to. Stir with ice & strain into a cocktail glass.